Catfish are part of a much larger group (order) of fish. There are many varieties of them throughout the world, but the one that is most commonly found in Southern Ontario is the Brown Bullhead. Their bodies are a brownish yellow colour. The top of a catfish is usually a dark brown and then it lightens to a yellow colour on the side of their body which leads to their white belly. These guys get their name from the barbells that poke out by their mouths making them look as if they have whiskers. They can range in size from just a few inches, if they are young, up to 20-35cm when fully grown. Once it is more mature it can weigh in at anywhere from 1 to 2 pounds. 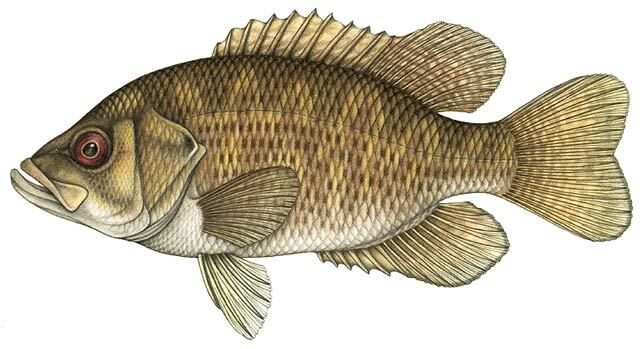 Rock Bass are close cousins to largemouth bass and smallmouth bass. Like their cousins they are also a brownish green color but they have rows of dark coloured spots. A smallmouth bass is a close cousin of the largemouth bass. However, unlike the largemouth bass, smallmouth bass are usually a little more brownish greenish in color and they have vertical bands along their sides not a large long black band like the largemouth bass.